Bring casual elegance to your table with the Pioneer Woman Cowgirl Lace 12-Piece Dinnerware Set. The Cowgirl Lace is a great set that brings a little country charm to both casual everyday dining as well as formal occasions. The set features a beautiful an embossed bead pattern and a scalloped design shape that bring a distinct elegance to the table. The set is available in a variety of color options that include linen, plum, light blue, red and teal. If you are looking for mix and match possibilities you can collect the Cowgirl Lace in all its color options and also match it with other Pioneer Woman dinnerware. Each item is made of durable stoneware and is dishwasher and microwave safe. The Pioneer Woman Cowgirl Lace 12-Piece Dinnerware Set comes with complete service for four including dinner bowls, salad plates and bowls. 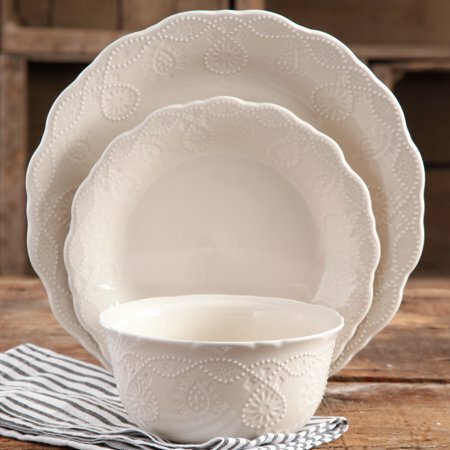 Make your meals memorable and elegantly simple with the Cowgirl Lace dinnerware set.